Q: Why am I being offered this opportunity to apply for sponsorship by the Foundation? A: Your record was reviewed by the Naval Academy Admissions Board and recommended to the Foundation as worthy of consideration for sponsorship. Over 100 names are typically forwarded by the Admissions Board to the Foundation each year. We anticipate being authorized to sponsor only 50-60 candidates for USNA in the coming year. This does not preclude you from still receiving a direct appointment, however, if attending the Naval Academy is your goal then this is a great opportunity. Q: Is there any guarantee that I will succeed in this program? A: No, your appointment is not guaranteed. Based on our track-record, however, your chances of receiving an appointment to USNA through our program are about 95%. In general, those who do not receive appointments either performed poorly academically or voluntarily dropped out of the program. 96.3% of our sponsorees received offers of appointment, for last year’s Foundation class. Q: Why should I attend a prep school when I've already been accepted by one or more fine universities? A: It’s a great way to come to the Academy. As a sponsored student, you’re “in the system”; therefore, you don’t need to re-apply to the USNA. Instead, if you choose to go to college, you’ll need to re-apply and go through the entire Admissions process again, where you will be competing against other Post-Grad students. As a Foundation student, you are in a separate pool altogether and not competing against anyone. Q: What are the advantages of being Foundation sponsored? As a Foundation sponsoree, you are "in the system", which means that you do not have to reapply to the Naval Academy. Your candidate file will be carried over from the previous year and is updated by any new SAT/ACT scores received, and your final (4 year) rank in high school class. You are not competing against other Post-Graduates, Foundation students, or high school applicants, i.e. : there is a spot reserved for each of you. The Foundation will assist in sharing the cost of attending the school which you are selected to attend, based on the need of the family and scholarship support available at the time. You will attend a preparatory school (or one of the two military junior colleges listed) instead of going to a college where you've already been accepted. There is a possibility, although small, of your not succeeding in obtaining an appointment to USNA. This depends primarily on your performance at the school attended which takes into account grades, motivation, citizenship, etc. as reported in the transcript and the recommendation from the school. Q: What are my responsibilities as a Foundation sponsoree? - Get the "right" grades which are mostly A's and B's. - Be a solid citizen (which means you do the right thing and obey the rules of the school you attend). Q: When will I know if I've been accepted in the USNAF program? - If you're interested in sponsorship, fill out and return the application and financial statement. - Your application must then, be approved by the Foundation. - Selection of the school for you to attend will then be negotiated between you, your parents (or guardian) and the Foundation based on the availability of post graduate student slots at the school-of-interest and your acceptability by that school. - The financial arrangements for paying the tuition, room, and board costs will also be part of this selection process. Do your best to qualify for entrance to the Naval Academy. Not voluntarily resign from the program or leave school unless of reasons beyond your control. Accept an appointment to the Naval Academy when offered. Q: How does one select the "right" school from the long list of generally unknown institutions? A: There are many ways to do this while still accommodating your own individual preferences and aspirations. Some students may prefer a military school, or junior college, to a civilian counterpart. You may be talented in a particular sport (like a recruited athlete) and may wish to attend a school which is strong in that sport. In this case, the USNA coach may also have suggested a particular school to you. You can call the schools directly (phone numbers provided). Ask them any questions you may have while you have them on the phone, since they are the admissions people who will know all the answers. View their websites, addresses provided on enclosed school listing. The best way, of course, is to visit the school in person and eyeball the place and the people, and talk to the students. That should give you some pretty reliable "customer sampling" to help you make a decision. Or, you can call or personally visit our office and we can discuss the various schools with you. If everything else fails, you can let the Foundation suggest the school selection for you, which sometimes happens anyway, if your first and second choice of schools are already full (up to the their quota of post graduate students). Q: How much will it cost to attend the school selected? A: The tuition, room and board (TRB) costs vary with each school as do the additional fees for things like books, medical, student account, laundry, lab fees, uniforms (for military schools), etc. Scholarship support will generally apply only to the TRB costs and not to those additional fees or transportation expenses. TRB costs at our affiliated schools run from about $10,000 per year to over $59,800. Scholarship assistance will be awarded in accordance with the financial need of the family in meeting those TRB requirements. Q: What sort of financial support from the Foundation might be made available to help meet the tuition, room, and board costs (TRB) at a particular school? A: The general policy of the Foundation is to request the family to fulfill a portion of the TRB as their financial situation allows. In arriving at an equitable share, we use a sliding scale which takes into account the family's adjusted gross income (AGI), as reported on the most recent tax return and the TRB of the school. NOTE: A copy of the family’s most recent IRS 1040 Tax Form showing “Adjusted Gross Income” (AGI) must accompany this application in order for it to be processed for consideration. We use what is known as a 40/300 rule to calculate the percentage of the TRB to be provided by the family. If the adjusted gross income (AGI) is between $40,000 and $300,000, we divide the AGI by 300,000 to determine the percent of the TRB to be borne by the family. This gives us a starting point; we are frequently more generous than the formula calls for. In this example, the scholarship grant is $20,000 ($30,000-$10,000) which, normally, is split between the Foundation and the school in question. The total scholarship grant is therefore negotiated through the Foundation, not the school. If the AGI is over $300,000, we normally ask the family to pay the full fare. In the current academic year, for instance, only about 10% of the families paid the full TRB while the Foundation (and schools themselves) provided the rest (about $1.3 Million) in scholarship support. If the AGI is less than $40,000 special financial arrangements will have to be negotiated between the Foundation and the family. Note: Most schools offer an automatic scholarship for USNA Foundation-sponsored students, regardless of family need. We consider this to be a reasonable approach for arriving at a fair share of the costs to be assumed by the family. This method is substantially more favorable for the family than the FAFSA formula for Stafford Loans/Pell Grants. Q: Since I'm a competitive wrestler/swimmer/football player/etc., will I be able to participate in my sport without losing NCAA eligibility? A: If you attend a preparatory school, the answer is, yes. We try to match the student who has a particularly strong sport, with a school which has a strong program in that sport. You will lose a year of eligibility if you compete in your sport at the college or junior college level. Note: Only 2 of our 18 schools are junior colleges: New Mexico Military Institute and Marion Military Institute. One is a 4-year college, Greystone Prep at Schreiner University. Q: Is age a factor during my prep year? A: Possibly. A limited number of our schools prohibit athletic participation in their league if a student has reached his/her 19th birthday before 1 September of their prep year. Be sure to ask about this when you talk to each school. Q: Are credits which I might earn at a prep school or junior college transferable to USNA? A: Not automatically. USNA does have, however, a validation program which allows a student to receive credit for a course by passing an examination for that course during plebe summer. This can be done regardless of where you went to school prior to entering USNA, high school, prep school, or college. 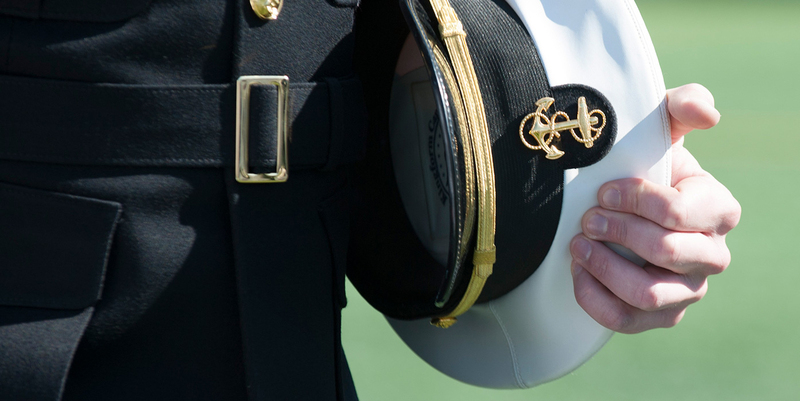 About half of the midshipmen entering each year will validate one or more courses. Q: Will I have to receive a nomination in the year of Foundation sponsorship? A: Yes. Everyone must have a nomination in order to receive an appointment to USNA. It is generally easier, however, to get a nomination from the Senator or Congressman from whom you received a nom the previous year. You are a "known quantity" in the second year and a more viable candidate under Foundation sponsorship. However, when reapplying for nominations, some Congressional/Senate offices will ask for an interview and it can sometimes be conducted by telephone or Skype interviews with you if you can’t come in personally. If you are unable to obtain a nomination but you are otherwise qualified for your appointment, Admissions will assist you in obtaining a nomination. Q: Will I have to take another medical examination? Q: Do I have to be personally interviewed as a part of the Foundation application process? A: No, because most candidates live too far away from Annapolis to make the trip. We do not need to interview you. Q: If I'm not interested in pursuing sponsorship by the Foundation, does my turning it down affect in any way my current status as a candidate for USNA? A: No, this offering is simply to provide you with an alternative route to the Naval Academy if you should need it and are inclined to pursue it. NOTE: While a year of prep school before coming to the Academy may sound unusual, you should know that about 1/3 of every entering Plebe class has gone through either a prep school program or college. And while a 5-year program to complete college sounds long, over half the students in this country exceed 5 or 6 years before obtaining their degree.